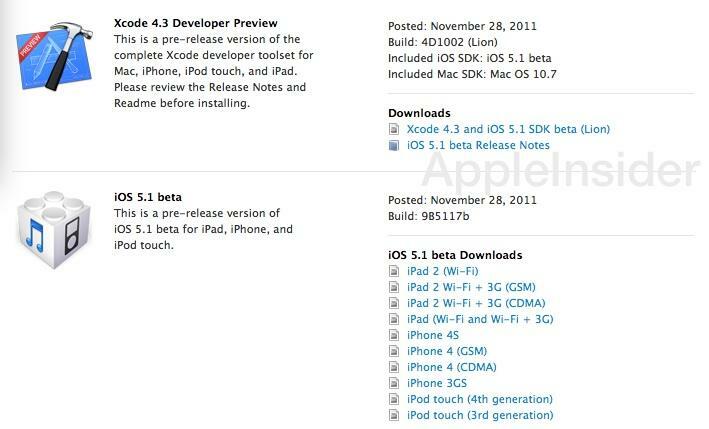 Apple has released a new iOS 5.1 beta for developer testing on all iPad, iPod touch and iPhone models that support iOS 5.0. The beta contains references to next-generation iPhone and iPad models. Update: Twitter user Filippo Bigarella uncovered references to a next-generation iPhone, "iPhone5,1," as well as third-generation iPad models, "iPad3,2" and "iPad3,3." References to an apparent unreleased iPad 2 model, labeled "iPad2,4" have also been discovered in the beta release, according to MacNN. Current second-generation iPad models range from "iPad2,1" to "iPad2,3." It has been suggested that the unreleased version may have been developed for an additional carrier partner, such as Sprint. The new build, designated as 9B5117b, must be downloaded from Apple as it is not yet available through over the air updates as previous developer builds have been. The 5.1 software includes enhanced dictation support during text input "on supported devices," something that has currently been limited to iPhone 4S, the only iOS device that supports Siri. Nothing in Apple's notes to developers suggests that Sir will be expanded to other devices, but the phrasing leaves open the possibility that at least the speech recognition portion of Siri's technology could be added to iPod touch, iPad and earlier iPhone models. Adding basic speech recognition features across all iOS 5 devices would bring Apple's offering into parity with Google's Android and Microsoft's Windows Phone 7, both of which include basic speech recognition features, although reviewers note that Apple's Siri performs both more accurate recognition and far more sophisticated actions based on recognized speech. Apple warns developers that the new build, once installed on a device, can not be rolled back to previous versions of iOS, likely due to baseband firmware changes. The company also warns that unauthorized use of the developer beta could result (for the same reasons) in an unstable device, possibly necessitating repairs that are not covered under any iOS device warranty. The latest version of iOS requires the use of the newest Xcode 4.3 developer preview toolset for building third party apps.